Conferences are important in geology as a way to share your research with others in your field, as well as a way of networking. Especially in a super international field like volcanology, it’s a really good opportunity to meet others whose names you recognize from papers you’ve read/cited, old friends from the other side of the world, and potential future collaborators. As I mentioned, volcanologists usually find a way to have their conferences in volcano-y places, and Puerto Varas fits the bill. It’s fairly close to two volcanoes, Calbuco and Osorno, and was even impacted by the 2015 eruption of Calbuco. Puerto Varas is considered the “German” town in Chile, as such is has a lot of European influence in the culture. It’s also a bit touristy, so it felt a little less “Chilean” than the smaller towns I’d been in to this point. Getting excited for conference time. So many friendly “stray” dogs. Mostly very docile, friendly, and fairly well cared for. Lots of nice sunsets with the volcanoes in the distance. A local artisan market. Wool, wool, and more wool! Another empanada, along with some “mote con huesillo”, a non-alcoholic sweet drink with a dried peach and wheat in it. Pichangas! I’d say it’s kind of like Chilean nachos. A geologic conference usually involves lots of talks and posters. You get a big program at the beginning, and you decide which ones interest you the most or are relevant to your research. It also means if there’s people you want to meet, you can get an idea of where they might be during the conference. I had a poster during the second half of the conference, which meant the rest of the time I was free to attend as many useful talks and visit as many interesting posters as I could. This conference had three streams of talks going at once, usually split into different categories ranging between physical volcanology (chemistry, physics, fieldwork, etc.) and volcano communications/social science, so you could hop around as things went to get a good mix of all the subjects you wanted to learn about. The poster sessions also had a mix of all the categories so you could talk to people from all parts of the volcanology community. Many of you know that I like making films about my and others’ research. I’m not alone! I was really excited that a couple of volcanologists from universities in England were hosting a movie session one evening (the VolcanOscars! ), showing self-made geology movies from conference attendees. I submitted my Vanuatu movie about Ben’s research on Yasur, and it was pretty surreal to see it up on the big screen with a room of 100 or so people ooohing at the explosions. A big conference needs big projector screens. Sophia is happy to be here. Registration desk, where you get your program and other goodies. An example of one of my friends from the UK, Lara, giving a talk. Showing my movie at the Volcanoscars session, super exciting for me! The instantaneous translators were amazing, it meant that everyone could participate regardless of whether a session was in English or Spanish. Felt like being at the UN! My poster! Full of pretty photos and figures. The opening and closing ceremonies has a number of cultural performances. As part of the conference, we had a field and cultural trip in the middle. Since so much of Cities on Volcanoes is about understanding the relationship between people and volcanoes, we visited a town, Río Blanco, that had been affected by lahars (volcanic mudflows) from the 2015 eruption of Volcán Calbuco in order to see the effects firsthand and talk to some of the townspeople. We were able to see the lahar path and some affected buildings, and we were treated to a presentation by some of the local officials on what it was like living through the eruption. They told us what their experience was, people’s reaction, the government’s response, and how they feel about the possibility of a future eruption. All in Spanish, of course, but one of the conference organizers helped to translate as we went. A church in Río Blanco that just narrowly escaped the lahar (with Calbuco in the background). Climbing down into the lahar channel. A waterfall upriver along the lahar path. A fishery building that was destroyed by the lahar. Meeting with the locals to hear about their eruption experience. Performance centre in Frutillar where we got to see a concert after the show. We were generously taken to a concert of Inti Illimani, a pretty famous Chilean folk band. Once the conference had finished, I had a couple days left in Puerto Varas before the next part of my trip. To take advantage of that time, Sophia, a fellow Auckland PhD who I was staying with, and I booked a tour to Osorno volcano. In the end, we got driven there and shown around by two Chilean guys, a bit surprisingly, all in Spanish, meaning after a week of mostly English at the conference I got to hablar español un poco mas! Sophia with our friendly neighborhood stray dog. It came to greet us every time we got back to our lodging! Volcán Osorno. It’s such a perfect cone because none of the recent eruptions have come out of the top, rather always out of a side vent. Looking across Lago Llanquihue to Calbuco volcano to the south. Osorno is a skifield in the winter. One of the small side eruption craters. A red scoria crater with Calbuco and the lake behind. With my time in Chile ending, I explored PV for another day, sent some postcards, enjoyed some more Chilean food, and then, since I was in the same hemisphere, I caught a flight back to Santiago so I could fly back to the US for a quick trip home. Monte Calvario, a little park in PV with good views of the volcano. In this case, looking at Osorno was literally a religious experience! Also had views of Calbuco, and PV’s famous church. So many volcanoes to see out the window on the plane flight back to Santiago! Bagels! As in good ones, not bagel-shaped bread. Christmas market in Bryant Park. Big highways with big cars! Big cities with bright lights! After seeing family and doing a fun things, I had a much-delayed, fairly hellish trip back to New Zealand via Chile. The one bright spot was a long-enough layover in Santiago that gave me a chance to go into the city for a little more sightseeing. I had one last ceviche and took a funicular to the top of San Cristobal Hill. Some little stalls in the park. View of Santiago from the top of San Cristobal Hill. Gotta have some religious statues. Reminded me of my days surreptitiously photographing the inside of churches in Italy. There were many of these colorfully-painted crosses. And from there, I finally made it back to Auckland, where I could enjoy my bottle of Chilean pisco in peace. As I sit in a lab in Australia waiting for my samples to make it through quarantine, maybe it’s a good time to continue my hopeless attempts to catch up on my horribly neglected blog. So, this time…CHILE! Part of academia is going to conferences to share your research with other scientists in your field. As volcanologists, we are pretty good at making sure those conferences also often happen to be in places with awesome volcanoes. That way we can learn about local interesting geology in addition to presenting our work. I was lucky enough to attend the Cities on Volcanoes 9 conference in Puerto Varas, Chile, last November. It’s a conference all about volcanoes and the people who live near them (hence the name), hazard mitigation, communication, and more. I was able to head to Chile a week before the conference to have a bit of a travel vacation with my workmate Mary Anne. What did I do on this vacation? Well…there’s a lot of nice scenery in Chile, and much of it includes tall pointy mountains that hot rocks come out of…and I may have spent most of my time looking at that. On our way to the Región de los Lagos, the part of the country where the conference was, we had a one day stop in Chile’s capital, Santiago. Enough time to take a look around, check out some nice parks and markets, and have some great food. The city was super smoggy. Wonder if that contributed to the amazing sunset. Some interesting modern sculpture. I wasn’t thaaat hot! I still like church architecture. This one is Iglesia San Francisco de Borja. Cerro San Lucia, a nice park on a hill with a hermitage on top and several gardens. View over Santiago from up on the cerro. Plaza de las Armas, the main square. The next day Mary Anne and I flew down to Puerto Montt, the city at the northernmost end of Patagonia, and rented a car so we could drive to some of the more out-of-the-way areas to the south. We were taking the Carretera Austral, the road that goes from the end of the Pan-American Highway as far south in Chile as you can go. It’s very much still a work in progress. Much of it is unpaved, and there are several ferry crossings where the road comes to an end. Our first stop was in Hornopirén, a small town near a national park and a few volcanoes. We did our first ferry crossing and found our way to a nice cabaña with fireplace–lucky since it spent the next day raining so hard we could barely do anything! One of our best dinners of the whole trip (and definitely the cheapest!). Empanadas are delicious! Funny warning sign from the first ferry. Our cozy lodging in Hornopirén, nice place to read on a torrentially rainy day. Church in the town centre. Volcán Hornopirén finally showing itself at the end of the storm. We were supposed to head on fairly quickly to our next location, but a ferry scheduling issue meant we had to stay an extra day. The silver lining was that it meant we had time to do the things we were rained out of the first day. We had a great hike to Lago Cabrera, the site of Chile’s biggest volcanic death toll. In the 1950s there was a rockfall from Yate volcano that fell into the lake, which caused a tidal wave destroying a settlement on the other side, killing 26 people. On our hike we passed a small mill for Alerce trees, a local type of tree with beautiful red wood. The monument to the Lago Cabrera disaster. Just can’t help ourselves! Checking out the pyroclastic deposits from Hornopirén and Yate. Looking across the lake to Yate, the bigger one. Hornopirén, the pointier of the two. Cool local flowers…interesting, there’s a lot in common between this region of Chile and New Zealand. They have similar latitudes. More views across the lake as the weather changed. …and got to watch a Chile/Uruguay football match with some locals. Once we finally sorted our ferry, we headed off further south. First a 3 hour trip, a short driving break, and then another short ferry ride to get to Parque Pumalín, a privately maintained conservation area with beautiful views and–you guessed it–a few more volcanoes! A big trip with lots of cars requires a BIG ferry! All the cars only slightly dampen the view…better look off a different side of the boat! Stunning views along the ferry ride. Waiting on the shore, eating lunch, as our second ferry comes to get us. The park is home to Chaitén volcano, which had a violent and destructive 2008 eruption, severely affecting the nearby town of the same name. As we drove through the park to the town where we were staying it was easy to see the effects of that eruption. Look at all those dead trees. They were killed instantly by the pyroclastic flows from the eruption. But it is impressive to see how quickly the lower vegetation has grown back in a short time. That one is Cerro Corcovado, one of the most stunning volcanoes I’ve seen, even from this distance. Hard to see the perfect pointiness and the craggy relief in the photo, but it was a view we could stare at endlessly from across Chaitén harbor. Our host gave us some recommendations for hikes the next day. Of course we were going to climb a volcano (duh…) but we had more time than that. We used to visit some waterfalls and more alerce trees. Our first hike was the Cascadas Escondidas trail, or the “hidden waterfalls”. Up and down a lot of very natural-looking ladders. A waterfall with a rainbow right to the bottom! The lahar path, where the products of the 2008 eruption entered a river and wiped out everything on the way down to the lake. Not a bad spot for lunch. If you thought we wouldn’t take time to look at the amazing rocks…you’d be sadly mistaken. Some awesome banded obsidian. With proper scale, of course! But of course the start of the show was Chaitén volcano. We took a few hour hike up to the top in the afternoon and got great views of the still smoking dome. See the steam rising from the volcano? More views of the dead trees. Made it to the crater rim to look at the dome! This house is buried up to the second story by mudflows from the eruption…much of Chaitén village is still not recovered from the eruption. Our pre-conference week was coming to an end, so we hopped on a 9-hour ferry back up to where we started. I got to work on my Spanish quite a bit more by watching some extremely family-inappropriate pirated movies that were being shown and had a chance to get a different view of some of the places we’ve been. Upon getting back, we had one more day with the car, so we took a trip to the the Saltos de Petrohué, a series of rapids and waterfalls near still more volcanoes! 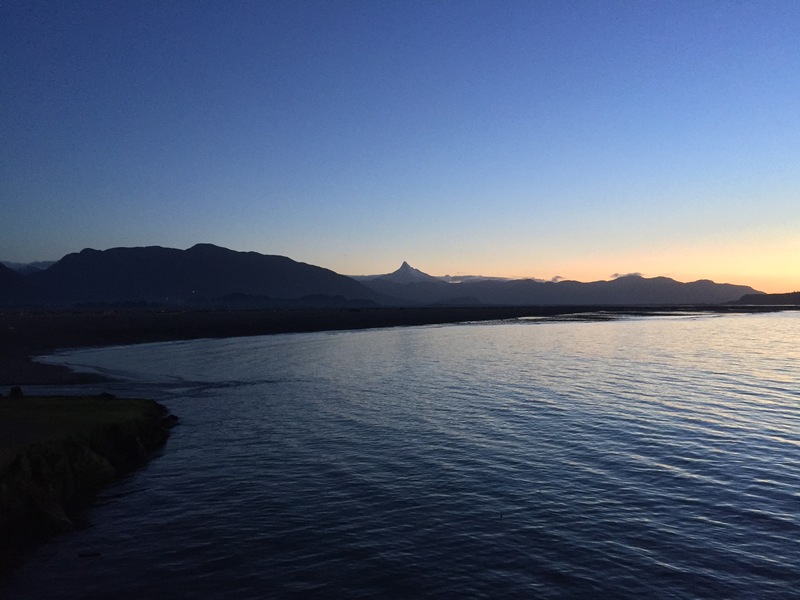 Looking at Calbuco and Osorno volcanoes from the ferry…we’ll get to those later. Calbuco volcano behind the port in Puerto Montt. I know it’s a warning about forest fires…but it’s still a bit ridiculous. …and really cool color contrast when you see them all together! Looking east from the tiny town of Petrohué at still more volcanoes, including Cerro Tronador (obscured by clouds). Another thing that was fun about the trip to this point was the language. While I studied Spanish all through high school and have practiced it beyond that, I’ve never had the chance to use it in a practical setting before. In the places we went, most people spoke no English, so I had to stretch my Spanish knowledge to its limit, and it was super fun. I felt like I was improving as the trip progressed, and really happy with how well I did. Halfway point in the trip is a good point for a break! I promise I will finish the second half soon! You believe me, don’t you?